Everyone has a favorite cake, but hardly anyone wants to go to all the effort to make one. The over-priced store cakes, on the other hand, are ususally coated with sickeningly sweet icing made with vegetable shortening and chemicals. You might find a better grade of cake at a bakery, but many bakeries have gone out of business due to the competition from the grocery chains. So, if you want that special cake, it might be time to find someone who will do the work...maybe that someone is YOU. There is a wonderful website which features the timeline of cakes...it also gives recipes for most kinds of cakes, and it answers almost every question one might have in regard to cakes like the following: Why are cakes round? Who invented Duncan Hines brand cake mixes? Is there soap in cake mixes? When did oil become a standard ingredient? Who was Duncan Hines...and so forth. Wanting to know the orgin of dump cakes, I found that certain versions of them were developed as far back as 1912...They were also called Wacky Cakes and Crazy Cakes...but, they were not exactly what I consider a dump cake. In 1979 cake recipes popped up for campers to use with their Dutch Ovens. These camper-cakes used a can of fruit on the bottom of the Dutch Oven with a box of white cake mix sprinkled over the fruit. The lid was put on the oven and the whole thing was placed on the hot coals with more coals on top...I think a person would have to be very, very hungry to enjoy such a concoction! Today's recipe, which is a dump cake, is so much more than the camper's delight...It is very easy; there is relatively little mixing...in fact, it probably takes more work to eat it than it does to put the cake together...I have cut the calories, sugar and fat by using Egg Beaters, Splenda and Smart Balance margarine. 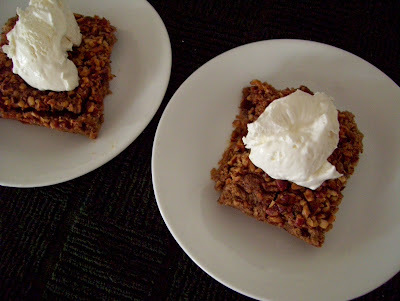 The sweet potatoes, spice cake and nuts are terrific flavors together. Preheat over to 350 degrees. Combine potatoes, Egg Beaters, and Splenda in a blender or Vita Mix. Puree. Using a rubber scraper, remove mixture to a greased 13x9 pan and spread evenly. Sprinkle dry cake mix evenly, crushing any clumps of mix between your fingers. Next, sprinkle chopped pecans over crumbs. Last, drizzle melted margarine evenly over nuts and cake mix. Bake 45 minutes. Cool and cut into squares. Serve with whipped topping. Makes 16 servings. Freezes well. Marian wrote: Your cake sounds like something that would quickly disappear at a church supper!